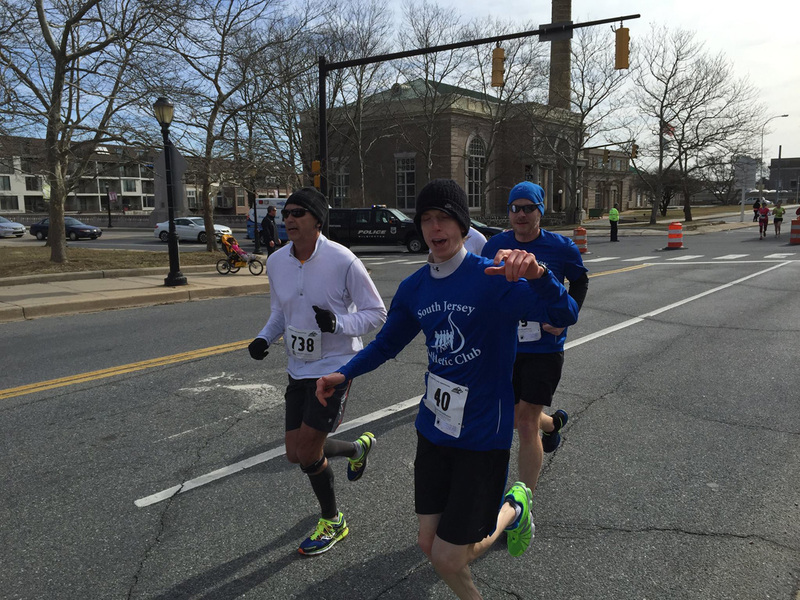 I have written about this race before, The Caesar Rodney Half Marathon, in which I described the race, its history, and the particularly challenging profile of the course. In brief, the first half of the race is relatively flat after an initial downhill first mile. Then, there is a long and sometimes steep, 2.5 mile uphill climb, a number of turns through neighborhoods, then a downhill stint to the final steep uphill 1/3 mile to the finish. This race is run the third Sunday in March, when chill winds still blow. In fact, this year, we had a snowstorm all day Friday two days before the race. Most of the snow on the streets melted the following day when it rose to 50˚F, but then the temperature dropped back to below freezing that night. For race day, we had gusty winds and temperatures in the low 40’s. Dan and Brian Ambrose pumping up for the hill. What is good about this race? It is one of the first races of the early spring, meaning to be in shape, one must train through the winter. So, it encourages fortitude in training when the weather is frigid, daytime hours are few, and the conditions on the ground can be pretty miserable. It is a race with a history. It is one of the first half marathons in the country, first run in 1964 when Browning Ross, from Woodbury, NJ, won it in 1:07:24. It has been run every year since then, making this year the 52nd running. It is well organized. 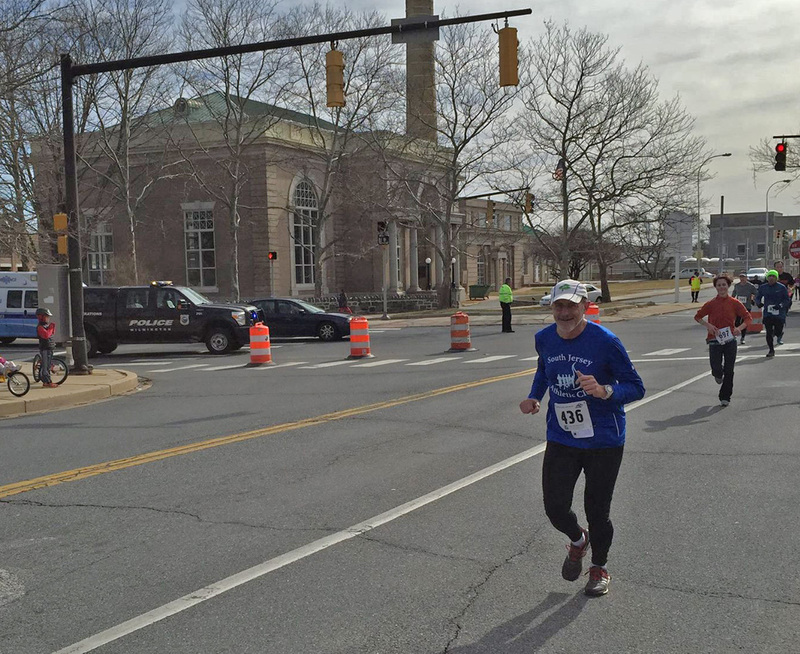 Runners are given permission to use the Downtown Wilmington YMCA locker rooms, to store gear, use indoor restrooms, and provide showers after the race. Few races I know of have that sort of facility available. Picking up one’s number and race packet is simple and done on the day of the race. There is a very friendly bag drop manned by volunteers. 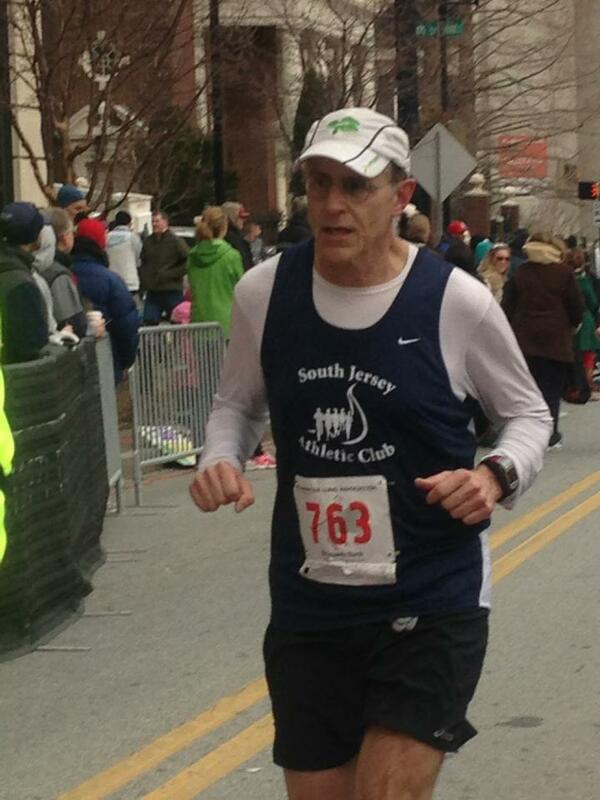 In fact, there is a friendly atmosphere throughout, and senior Delaware Senator Tom Carper, former Delaware governor and congressman, former naval air commander during the Viet Nam war, runs the race with the rest of us. It is for a good cause. 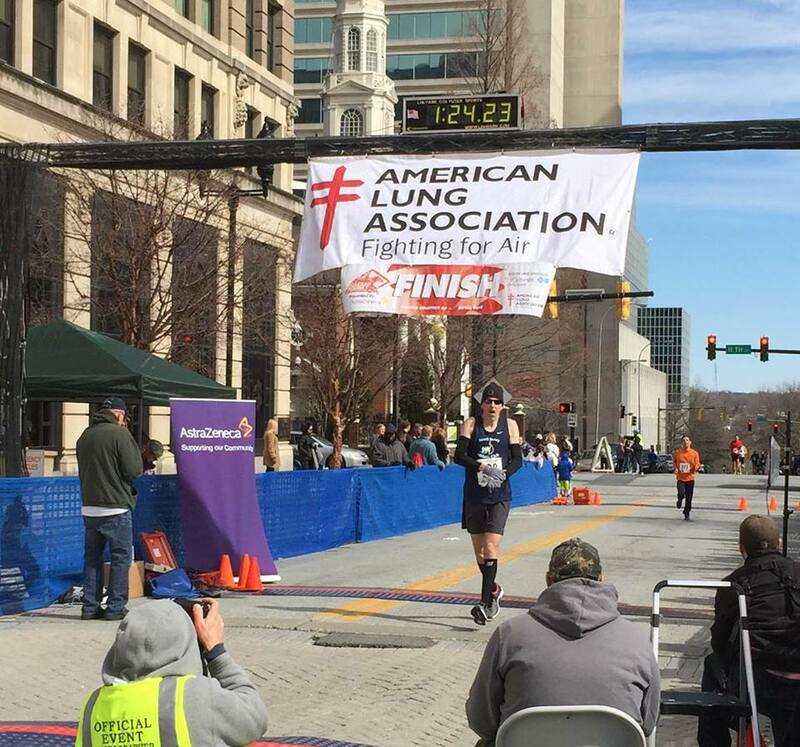 The money raised goes to support the American Lung Association, certainly an easy tie in with running. Brandon at the finish line. This year I wanted to break out of my rut. 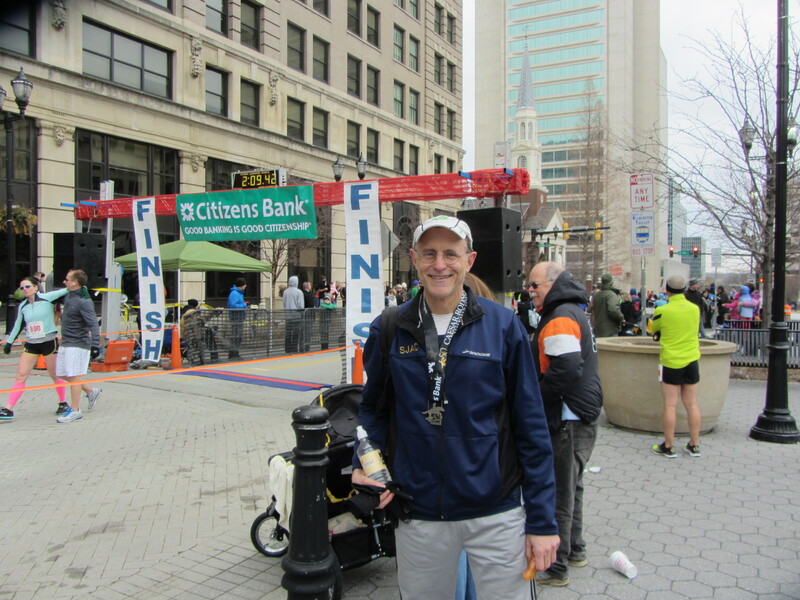 I ran fairly consistently through the darkest days of winter, through slush and cold rain, enjoyed the occasional cold but sunny morning run on the weekends, and was feeling pretty good going into the race. Still, I had some trepidation. I know the course, and how challenging it is. After running it all these years I know every turn, and know when it seems like the race will never end. So, I lined up with everyone else at the start, and took off feeling good. One cannot help feeling good in a race which starts heading downhill for a mile. Of course, the clever among us will recognize uphill is coming. Instead of feeling washed up as the road headed up, though, I felt I still had some energy in me, and managed to gut out the 2.5 mile climb mid-race. I cruised back down the hill towards the finish, and my good friend and running partner, Brandon, came back to encourage me on the last mile. This all resulted in a very satisfying finish of 1:47:56, my best half marathon anywhere. 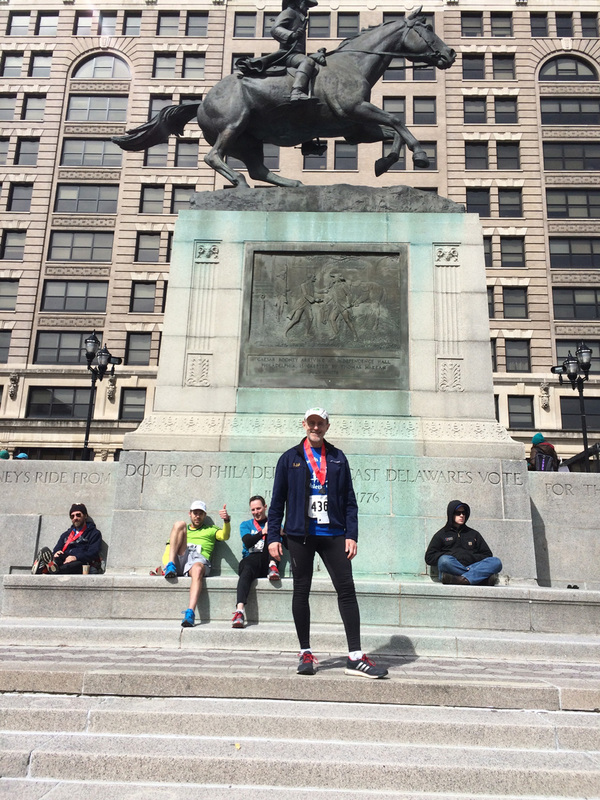 I finished fifth in my age group, averaging 8:15 per mile. After the finish, a new half marathon PR for Frank. Now, I’ve set the bar higher for myself, and each year get older. I’ll really have to turn up the training screws next winter.